TYWKIWDBI ("Tai-Wiki-Widbee"): An "all-natural baby"
That is something I hadn't thought about... despite being adopted myself. All the hoops you have to jump through, compared to people who just 'do it' and squat one out. @kolo. As an adoptee myself, as are my three younger siblings, I couldn't agree more, and I have for most of my life. 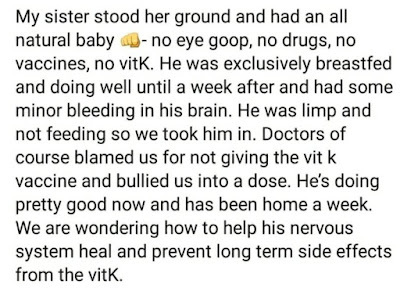 "...long term side effects from the vitK." You mean like maybe having a chance to live a long, happy, and healthy life? "Some minor bleeding in his brain." I don't consider any bleeding on the brain to be "minor". "Vitamin K plays a key role in helping the blood clot, preventing excessive bleeding." 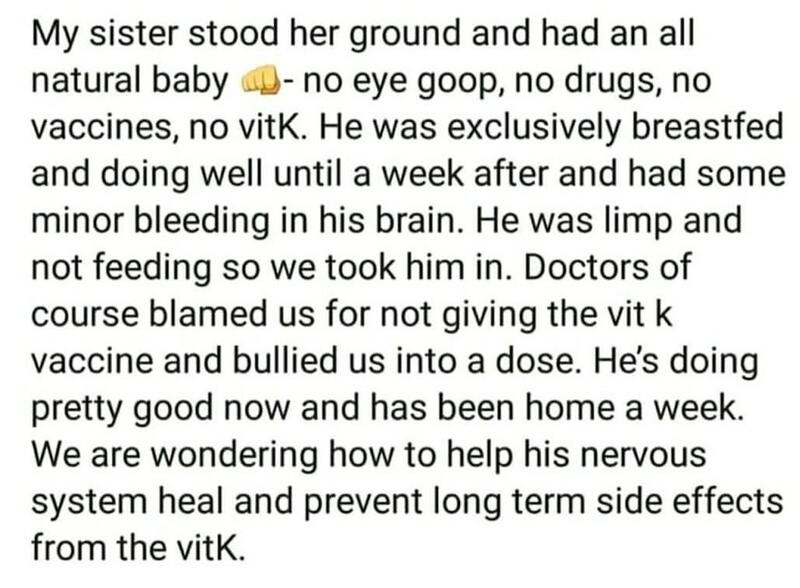 Those doctors are CLEARLY monsters. Unlike the parents who are NOT going to vaccinate their kid. We mock antivaxers, but is their irrational insistence in anti science really any different than organized religion? Soooo, what you are saying is we should mock the religious too? I am all for mocking people who refuse to accept well demonstrated facts that benefit themselves and society, but just belief in a deity seems a little harsh. Unfortunately, "just belief in a deity" is hardly ever that; it comes with side-beliefs and side-effects and the urge to mess with other people's lives because of one's belief in an invisible friend who talks to you while claiming infallibility on the one hand and threatening you with everlasting Hell with the other. Yea, it is very different because they are directly threatening our health by breaking herd immunity and allowing diseases once thought eliminated in the US population back into society. We should not ever mock another person for their beliefs, lest we open ourselves up to being mocked for our own. We can and should mock those who choose to deny objective reality in favor of those beliefs. Here's the fundamental difference. Belief, that which cannot be proven true or false, is the province of religion. Fact, that which can be proven or disproven, is the province of science. Both are valuable tools, but not interchangeable. You wouldn't use a hacksaw to hammer a nail, nor use a hammer to cut wood. That does not mean that either tool is useless; it means that each tool has a distinct purpose. In the case of anti-vaxxers, they deserve all the mockery we can heap upon them, because they are choosing for whatever reason, to ignore provable, demonstrable fact in favor of their own misguided beliefs. They are using the wrong tool for the job. That is why they are idiots. A: Please educate yourself as a population broadly and deeply (in this case, about what all these things do in the body, the pros and the cons, the timelines, etc,--there are many other issues out there with their own permutations). B: If you are going to decline modern medicine (your right as an american with freedom of religion, etc), you must embrace the fact that most likely you and/ or your baby will die, possibly horribly. And you have to say the equivalent of "well, its god/nature's will/way, it will all ballance out in the end", and not make junk posts about how horrible it all is. Own it. Say "yes, for the good of the world, i am helping to keep the population down, weeding out the weak, and sending more innocent souls to the great whatever". You know what else is natural? Death.